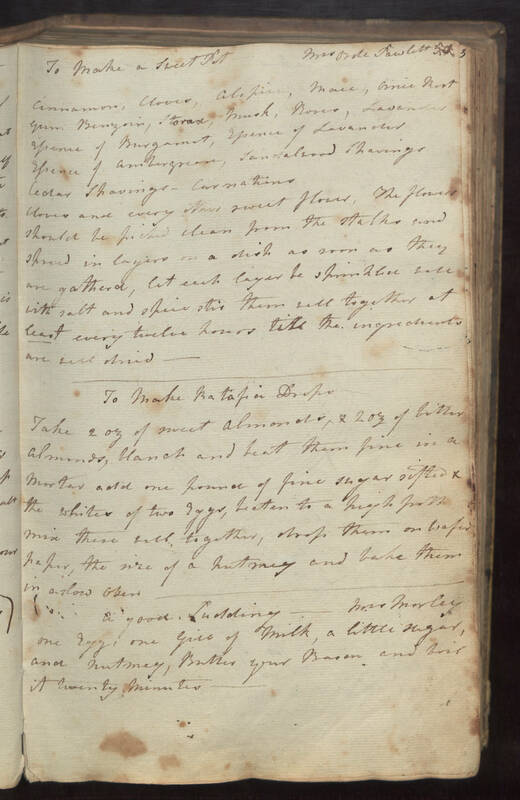 To Make a Sweet Pot Mrs Orde Pawlett Cinnamon, cloves, Alspice, mace, [Arnie?] Root gum Benzoin, [Storax?] musk, Roses, Lavender, Essence of Burgamot, Essence of Lavender Essence of ambergrean, sandalwood shavings, cedar shavings, carnations cloves and every N[ew?] sweet flower, the flowers should be picked clean from the stalks and shred in layers on a dish as soon as they are gatherd, let each layer be sprinkled well with salt and spice stir them well together at least every twelve hours till the ingredients are well dried. To Make Ratifia Drops Take 2 oz of sweet almonds, & 2 oz of bitter almonds, blanch and beat them fine in a mortar add one pound of fine sugar sifted & the whites of two Eggs, beaten to a high froth mix these well together, drop them on wafer paper, the size of a nutmeg and bake them in a slow oven. A Good Pudding - Mrs Morley one Egg, one Gill of milk, a little sugar, and nutmeg, Butter your Bason and boil it twenty minutes.